I make Chili frequently in the winter. Using my electric pressure cooker makes it so easy! I really liked this recipe. You can make it as basic or as fancy as you want. I usually leave out hot spices as some family members do not tolerate it. I increased the meat to 2 lbs. 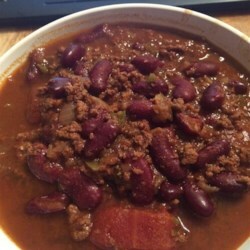 as family likes a lot of meat in the chili. Also, I only added enough additional water to rinse the tomato sauce cans, probably 1/2 to 1/3 cup as we like our chili thick.